Real cognitive agents are poised to impact business operations in a significant way. Most people are familiar with consumer-focused conversational assistants, like Alexa and Siri, or traditional chatbots that provide automated conversations using rules-based programming. 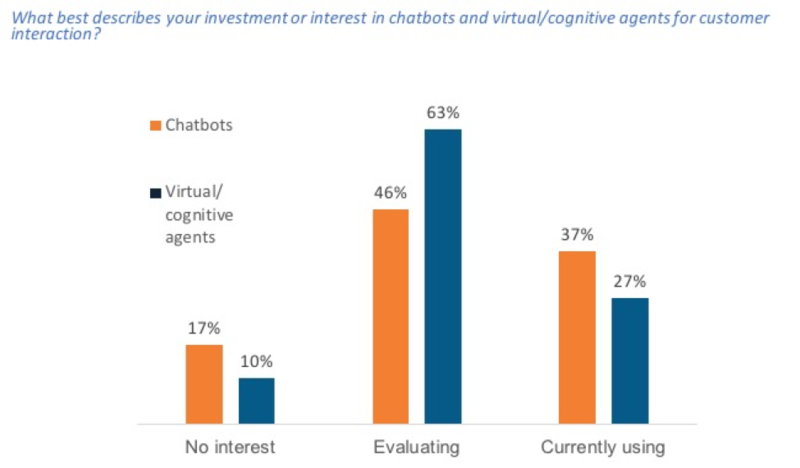 Enterprise-level cognitive agents, while still very nascent, have greater learning and processing capabilities that transcend those basic conversational tools. True cognitive agents will have the ability to self-learn and self-remediate, and are capable of executing on business processes. They also often have the ability to understand structured and unstructured data, and to use natural language processing to learn, comprehend and recommend next steps. Advanced cognitive agents may also enable predictive decision-making using real-time analytics. They can be used externally to communicate with end customers for customer service inquiries as well as internally to augment customer service staff with knowledge management, for IT helpdesk support, or to assist with HR or finance processes (such as employee onboarding). Cognitive agents are not simply about cost reduction or call deflection. Enterprises aren’t investing in cognitive solutions for cost savings. Cognitive agents have been shown to deliver improved security, customer and employee experience and visibility over business processes. In general, the greatest benefits C-suites have realized through their cognitive technology investments have been improved data security and simplified business processes. In the front office or call center, many cognitive agents today are used as “assistants” to live agents, helping them to find information for the customer faster and/or recommend personalized offers. In one enterprise use case, we heard about cognitive agents helping to weed out would-be phishers before the live agent interaction (which in turn, reduced Average Handling Time). When used within internal enterprise processes such as HR, cognitive agents have shown the ability to speed up onboarding processes and reduce security concerns and errors. The success of cognitive agents is more about culture than technology. An unwillingness to change and let go of past investments is often what is holding back business from experimenting with or successfully implementing cognitive agents. When investing in cognitive solutions, some of the primary issues to be addressed are change management, cultural re-alignment and a shift in talent requirements. Those who have successfully implemented cognitive agents spoke of the need for transparency and being clear about anticipated business outcomes. Business leaders need to be focused on employee impact and demonstrate how cognitive agents can enhance their jobs, not diminish or eliminate them. It is important to place employees, as much as customers, at the center of any digital business transformation to ensure that culture, values, talent and business process expertise are not lost amidst the changes. Bottom line: Cognitive agent technology is here. Now enterprises must find the right business problems and opportunities to apply cognitive agents and develop a culture that aligns employees to these outcomes.